The first time I saw a puffin, it was a revelation. I’d seen pictures of them, of course – the stocky, flamboyantly-beaked little seabirds who always seem to be wearing expressions of sympathetic concern – but I’d never seen one “in bird” (the avian equivalent of “in person”). I was returning from Rockport, Maine, having retrieved my daughter Skye and her friend Bau-Hien from a photography workshop. On our way home, the three of us were planning to stop for a cruise near Hog Island, the famous Audubon camp. En route, the teenagers were chatting away when suddenly I screamed “Eagles!”, yanked the steering wheel to the right, slammed on my brakes, grabbed my binoculars, and threw myself out of the car. Soon the girls emerged. Skye wore a long-suffering expression, while Bau-Hien – whose parents had settled in Texas after leaving Vietnam – regarded me with a mixture of fascination and alarm. “Bald Eagles,” I said encouragingly/defensively/lamely. “We had one in our bathroom a couple of months ago,” said Skye. 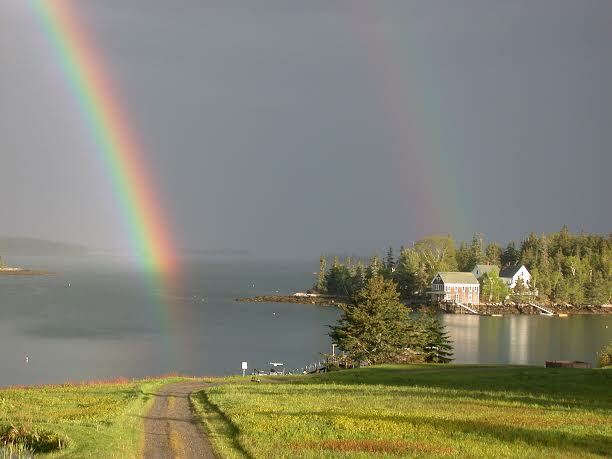 Hog Island is a 330-acre island off the coast of Maine, about an hour and a half north of Portland. Audubon acquired the island in 1936 and the mainland property on the shoreline of Bremen in the 1940s, eventually turning them into one of the first nature education sites in the country. 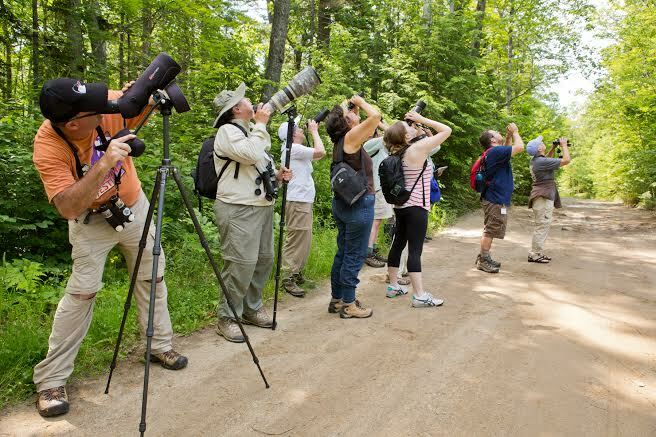 Early teachers included the legendary writer/artist Roger Tory Peterson and pioneering bird photographer Allan D. Cruickshank, who would occasionally return from expeditions standing on his head at the bow of his boat, a signal to campers that he had spotted a rare bird. Rachel Carson was a frequent guest in the 1950s. Soon after our late afternoon arrival we met up with my friend Pete Salmonsohn, Education Coordinator for Audubon’s Project Puffin, who hustled us into a van for a 20-minute drive to New Harbor. 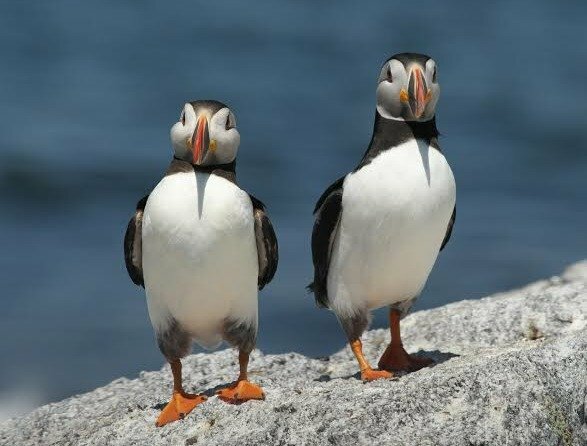 There are no Atlantic Puffins on Hog Island; they live locally only on Eastern Egg Rock, a painstakingly-restored seabird nesting colony which hosts three species of tern (including the endangered Roseate Tern), Eider Ducks, Black Guillemots, and more, as well as 120 pairs of puffins. The elongated little cannonball hurtled past us not with casual grace, but with furious determination. She landed on the water, dove, and disappeared from view; eventually she somehow returned to the air carrying a dozen slender fish, a feat which seemed aerodynamically impossible. Even those who were clearly on board only to earn relationship points, expose their children to nature, or checklist the Sights of Maine broke into grins. How could you not? The mission of wildlife rehabilitators is to return injured birds to the sky, or the sea, or wherever it is they came from. We want all birds to be bursting with health, and we revel in our rare idle moments. But just for a second, I became a heretic: wasn’t there an injured puffin around somewhere, I thought hopefully, who needed my help? Puffins may be the area’s poster bird rock stars, but the spruce-covered Hog Island, seven miles away, is a birder’s/naturalist’s mecca: Parula, Blackburnian Warblers, Red-breasted Nuthatches, Swainson’s Thrushes, Purple Finches, Osprey, the occasional nesting Merlin, to name just a few. A half-hour boat cruise around Eastern Egg Rock gave me a glimpse of seabird paradise, then yanked it away. I wanted more birds. And now, four years later, I’m finally going to get them. 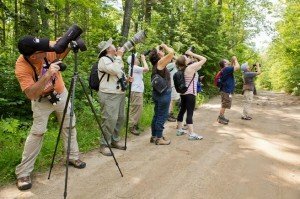 From June 1 to September 26, Hog Island offers week-long residential birding and nature programs for adults, teens, and families. 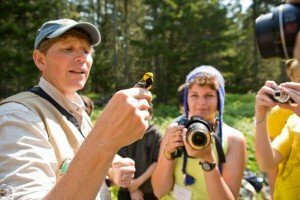 Campers don’t simply take a quick trip on the Hardy Boat; they stay in turn-of-the-century buildings within a wooded wildlife sanctuary, spend their days exploring the rocky coastline, and take daily field trips to hike the Hog Island trails with a world-class team of birders, naturalists, conservationists, and artists. Campers help with conservation projects, perfect their birding skills, add to their life lists, expand their knowledge, and hone their artistic skills (art, writing, photography, and video). There are boat trips to Eastern Egg Rock, as well as to other small islands. Reading the program list made me bird-giddy: how could anyone even remotely interested in birds decide which one to attend? The ornithological all-star lineup is dazzling: Pete Dunne, Director of the Cape May Bird Observatory and founder of the World Series of Birding; author/naturalist Scott Weidensaul, whose Living on the Wind was a Pulitzer Prize finalist; Yossi Leshem, Israel’s best-known ornithologist; and Stephen Kress, Director of the Seabird Restoration Program, Founder of Project Puffin, and manager of National Audubon’s Maine Coastal Island Sanctuaries. This is only a partial list. And so for a week in June, I will transform from a bird rehabber into a birder; I will hang out with the glitterati of the bird world and look for birds, talk about birds, write about birds, learn about birds, dream about birds, and do everything but fix birds – although, I suppose you never know – and I’ll see how the other half lives. Bird people! Nature lovers! Come on up. The birding will be fine. Oh….if only…….please, this sounds like great writing material too! Absolutely! And I may have to take up drawing, painting, photography and videography as well!